The sturdy truck rolled to a stop, dragging with it a cloud of dust and the last crunch of rock under our tires. Sliding out of the cab and stretching, I walked around the faithful rig as the dust settled again on the old road. The three of us were seemingly alone under the clear blue sky as we walked toward the lonely wooden signpost where the two rocky dirt roads met. In the distance a small dust cloud tracked the progress of another vehicle further down the road approaching us, the faint rev of it’s engine breaking the dry silence. We gathered around the signpost, inspecting the various pots and kettles strung from the structure with rope and twine hanging lifelessly in the still morning air. 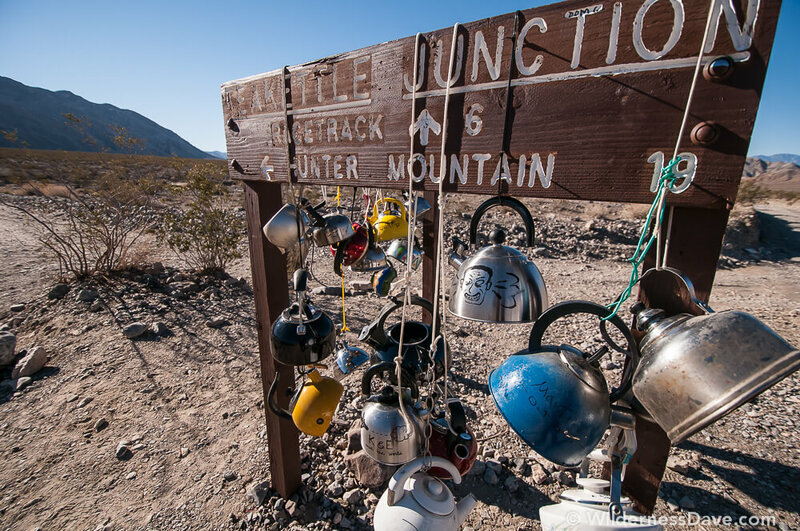 The dry, cracked wooden gallows supporting the abandoned ornaments read in bold lettering, “Teakettle Junction”. Scrawled on the outside of many of the kettles left dangling here are messages, names and dates of the travelers who have passed through this remote place. We soon discovered there were further messages left inside some of the pots, some with stories of their travels and some with messages or poetry for their would-be readers. The whine of the distant engine grew louder and soon the motorcycle weaved to a stop at the crossroads next to us, the driver climbing gingerly from his abused seat, stripping off his helmet and expertly lighting a cigarette. Conversation began, as it usually does between travelers crossing paths in the middle of nowhere. He was from Portland, riding support for a group of mountain bikers trekking through the backroads of Death Valley National Park. They had overnighted in the backcountry and were making the arduous journey over the pass on these rocky, uneven roads that had proved challenging even for the motorcycle, let alone the adventurous souls peddling through the wilderness. Our new friend asked some questions about road conditions and travel suggestions. Luckily, we had a companion with experience on these roads in Death Valley and experience on a motorcycle and could offer valuable information. We made sure he had enough water and supplies, offering him whatever he might need. But like many people you will meet in hard, lonely places he was happy and content with what he had with him and graciously declined our offers. My name is Evelyn and I’m from Barcelona, Spain. I was travelling around the world with my fiancé (we got engaged during our trip, in Sedona), and one of our stops was this Teakettle Junction. When we saw it, there were’nt as many teakettles as we thought there would be. But anyway, we left ours and continued with our journey. The thing is, after our trip, once we got home, we started googling for pictures made after our visit, to see if we could find our teakettle in someone’s picture… And voilà!, you took that picture, our teakettle is the one with the initials K & E. (Kenneth and Evelyn). So thank you for taking that photo, it made our day! It was early. Very early. It was still dark when I cracked my weary eyes and peered sleepily out of the opening in my mummy bag stretched across the cot. The weather had been a little windy, but nice and I had slept in the open that night so I could watch the stars. I rarely sleep through the night when camping so I like to sleep in the open so that when I do wake, I can mark the progression of the constellations across the sky. Orion was gone, so I checked my watch, 4 AM. A short while later I noticed the slightest bit of light to the south and it looked like there might be some clouds in the sky. Clouds are good for sunrises, clouds give the light something to play with, something to paint with vivid morning color. I would need at least an hour to drive to a part of the valley with features that would work with sunrise light. My makeshift bed sat at the north end of Death Valley in Mesquite Springs Campground and I wanted to at least get to the Kit Fox Hills area for sunrise. If I was going to make it work I needed to get in the truck now. I debated it for a minute or two then decided this might be my only shot for a showy sunrise in Death Valley. In the truck and headed south the light was coming on fast and I realized I was running behind, I wasn’t going to make it. No one else was up and the road, the park, was deserted in the early morning. I increased my speed. I wasn’t going fast enough. An amazing drama of color and light was unfolding in the sky and I was racing along a lonely paved road to greet it. I stopped at one point to take a few pictures in fear that I would lose light before I reached the hills. A few images snapped off and I jumped back in the truck, the hues of this story were only getting deeper. I eventually reached an area along Kit Fox Hills where I could shoot. I jumped out of the truck with my gear and began walking, stopping here and there with the tripod to grab a shot or two then moving on. I was trying desperately to get as much of this sunrise as possible AND look for interesting compositions at the same time. I didn’t have the luxury of milling about thinking through angles, compositions, details and subjects. At one point the light became so intense that I couldn’t get a shot that wasn’t overblown with oranges. The entire valley, including myself, was on fire with orange light. It was a very strange sensation to be physically lit with the morning glow I’d been chasing. I was immersed in light for a fleeting moment and then it started it’s retreat. The light moved, danced and changed color bouncing playfully around the valley. On these trips I make a habit out of catching at least one sunrise while I’m there. The sunrise experience is unique in each place and can be one of the most amazing experiences you’ll have. The best part is that you will usually have the world all to yourself since most travelers won’t bother to crawl from their tents before light. Sunrise and sunset are prime in the desert environment of Death Valley…not to be missed. Our National Parks are a travel destination for people from all over the world. They are home to some of the most amazing and unique natural environments our country has to offer. They are a national showcase and we should be proud to show them off. But they are also wild, untamed places that deserve our attention, our respect and just a little common sense. 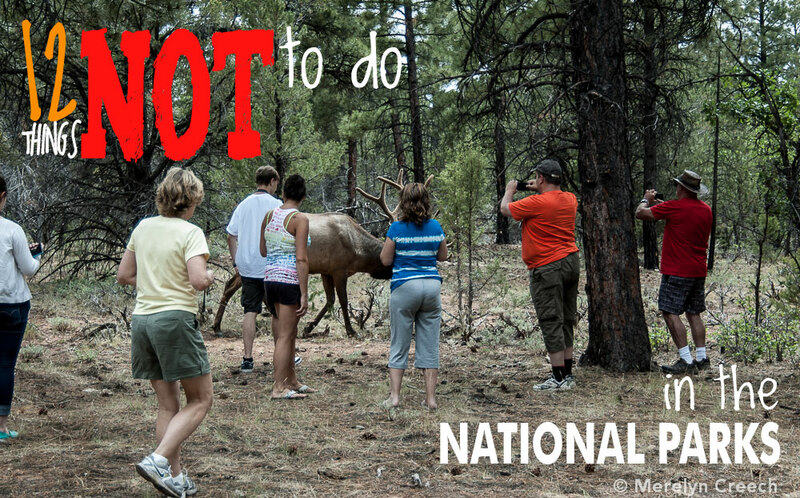 I asked on Twitter “give me examples of what NOT to do at a National Park” and here are the top 12 responses. “Volunteers in Great Smokey Mountain National Park spent 3,410 hours exclusively on litter patrol…another 4,518 hours cleaning up our backcountry trails and campsites and then another 3,352 hours on special patrols in the backcountry where we had to recover large amounts of litter left behind by unprepared hikers…” said Dana Soehn, volunteer coordinator for GSMNP. Many of the National Parks have extensive recycling programs to limit their impact on the environment. More and more of the parks have added water filling stations and have stopped selling single-use water bottles in the park in an attempt to reduce litter. The impact in these natural areas is huge, even small parks like Sleeping Bear Dunes in Lake Michigan collects as much as 69 tons of litter every year. KeepAmericaBeautiful.ORG has a great page that discusses litter, the costs, environmental effects and how we can effect change. Existing litter is commonly sited as the biggest reason why people think it’s OK to litter, so we can do our part to reduce littering by simply cleaning up existing trash. Before leaving your campsite or picnic area, take a look around and pick up any trash you can find…even if it’s not yours. A little personal responsibility goes a long way. Earlier this year, Saguaro National Park saw a rash of vandalism in the park. Signs, rocks and saguaro cacti were tagged with spray paint and some were destroyed. Some of the cacti damaged were 100-150 years old. Also earlier this year, Joshua Tree National Park saw at least 17 sites defaced by spray paint, some of which covered ancient petroglyphs. A 30 square-foot section of a popular rock climbing route in Rocky Mountain National Park was covered in graffiti last Summer prompting a federal investigation. Some blame social media for the recent rise in vandalism in some of the parks. According to the National Parks Foundation there were close to 2,000 reported incidents of vandalism in National Parks in 2012. The fact is, vandalism isn’t new and some people simply have no respect for the parks, nature or others. Some people don’t understand the amount of time it takes for natural resources like rocks and plants to recover from such senseless acts. Incidents like these will only lead to tighter restrictions and reduced access within the parks in an attempt to keep the parks safe. Just last year a set of 3,500 year old petroglyphs in the Volcanic Tablelands area outside Bishop, California were cut from the volcanic rock face and stolen. A newspaper article from July,2000 sites “visitors seeking souvenirs” as the main source of theft in National Parks stating, “nearly 20,000 known violations” in 1999, up 46% from 1998. An estimated 12 tons of petrified wood is stolen from Petrified Forest National Park every year by visitors taking “souvenirs” from the park. Thousands of protected fossils, Native American pottery and arrowheads, Civil War relics as well as countless plants and animals are removed illegally from the National Parks every year. In some cases it is a true form of theft from poachers and artifact collectors, but often times it’s the senseless collection of keepsakes from casual park visitors that does the most damage. People think, “It’s just one small rock/stick/potsherd…what harm could it do?” Well, when the over 3 million visitors all think that way, it can cause irreparable damage. I think Evie provides a great example to all of us. In 2010, Donald and Cathy Hayes were charged by a Buffalo at Yellowstone National Park after wandering too close the animal to get a “closer-shot”. In 2011 Photographer Ben Chase observed visitors walking within 50 feet of a brown bear in Grand Teton National Park. When the bear got spooked and attempted to retreat, the ridiculous tourists yelled, “It’s leaving, go get it!” and gave chase. Yosemite National Park has a long history of visitors getting close enough to let bears take food from their hands, one older story actually tells of a clueless tourist holding bacon in his mouth and encouraging the bear to take it. At Grand Canyon National Park, several deer are put down every year because they have consumed plastic wrappers that interfere with their ability to digest food. Deer and other animals like coyote, Ground Squirrel and Bighorn Sheep have learned that these wrappers sometimes contain food. Visitors feeding animals chips, crackers and junk food have developed some dangerous habits among the wildlife. Animals expecting hand outs can be aggressive and violent often kicking and biting visitors who get too close. The National Parks are protected wild places. Don’t let the visitor’s centers, tour buses and crowds of people convince you that it is anything less. Treating the wildlife like characters in an theme park is dangerous, disrespectful and deadly. Though these animals live in close proximity to a place frequented by humans, they are still wild animals and are dangerous and unpredictable. Rodents like squirrels, chipmunks and mice are notorious scavengers and can carry diseases. Feeding these animals just encourages them to be more aggressive around humans. Use discretion and good sense when engaging with wildlife, keep safe and enjoy the scene from a distance. As I write this, over 50 major bush fires blaze across the western states including The Rim Fire in Yosemite National Park. Forest fires are a natural phenomenon and part of the ecology. Afternoon lightning storms passing through forested regions during the dry months of Summer can ignite natural fires cleansing the forest of an overabundance of dry and dead debris. Out of the nearly 75,000 wildfires reported each year 90% of those are caused by people. Human caused fires are not usually in areas that would naturally burn. These fires are also typically much closer to higher traffic areas and habitation than natural fires, making them especially dangerous putting lives and property in danger. Unlawful fires and negligence in the National Parks can carry stiff penalties including fines and potential jail time. Never leave a campfire unattended, and be sure it is “dead out” before leaving the area. Have a bucket and shovel handy when having a campfire (required to camp in some areas). Cigarette smokers should smoke on bare ground or soil (not in or near vegetation) and pack out their cigarette butts. Fireworks are prohibited in all national forests, national parks, state lands, and all private land the state identifies as classified forest land. Pay attention to fire warnings and seasonal restrictions, they’re there for a reason. Hunting within most National Parks is prohibited. Even in those areas where hunting is allowed, it is very strictly regulated. This is all in the name of resource management, the primary duty of the National Parks Service. Managing the wildlife and their habitat is a huge part of what they do. In many cases the Parks Service is managing and protecting threatened or endangered species like the Bald Eagle, Grizzly Bear and the California Condor. Poaching is not limited to game animals. In many parks, poachers collect endangered or protected plants and minerals as well. Smoky Mountains National Park in particular has had major issues with ginseng poachers. If you witness, or discover evidence of poaching in the National Parks you should report your findings to a Park Ranger immediately. Let’s just be real here…blasting loud music in camp (or anywhere) is obnoxious, annoying and disrespectful to the other campers. Most developed camping areas, including those at the National Parks, have “Quiet Hours” from dusk until dawn (often 8PM to 8AM). Ignoring Parks regulations can result in fines and potential ejection from the campground. Really though, blasting loud music at camp is a simple matter of disrespect and a lack of common courtesy. Somehow your good time is more important than everyone else’s and you want to crank that volume UP with no thought of how your camp neighbors feel about it. It’s noise pollution, audio-vandalism, and it has no place in the National Parks. There are plenty of unregulated recreation areas where beer-swilling party animals can have a rowdy night in the woods. The National Parks are far too crowded for that kind of activity. If you are unfortunate enough to be the victim of a noisy camp neighbor, the easiest thing to do is simply ask them nicely to turn it down to a reasonable level. In some cases, it really is just a matter of not realizing how loud they are being. If they resist or become belligerent it’s best to report them to a ranger or camp host. In most cases, the camp host will walk around the campground at the start of the Quiet Hours anyway to make sure music is low and generators are turned off. National Parks Service Rangers are those keen and patient men and women in uniform that are charged with the protection and preservation of our National Parks. These fine individuals not only work to keep countless Parks visitors safe and informed, but they are also responsible for enforcing compliance with the statutes and regulations of the Parks. So not only do they manage the park’s resources but they also serve as law enforcement within the park. And while the number of Parks Rangers decreases, the number of people visiting national parks is at record highs. This imbalance is continuing to create tension between visitors and rangers. Threats and assaults on U.S. Park Police, rangers and wildlife agency staff increased by more than a third in 2012 inlcuding the New Years shooting death of a ranger at Mount Rainier National Park, threats of arson at a visitor’s center in Texas and shots fired at a ranger driving in a Federal Recreation area in Arizona. The attitude toward Parks Rangers has gone way beyond disrespect. Visitors need to bear in mind the monumental tasks these Rangers face in their duty to protect and preserve the parks. Without them, the National Parks would not be what they are today. Speed limits exist for your safety and the safety of everyone else on the road. In the case of the National Parks it’s also about protecting wildlife. Most developed Park roads have a 45 MPH or less limit and can seem pretty slow to visitors cruising in from long stretches of 70 MPH highways. In 2011 a three vehicle accident injured 8 people and temporarily closed the South Entrance to Grand Canyon National Park. Already this year, 13 bears have been hit by speeding motorists according to the Yosemite National Park website. Yellowstone National Park reports over 100 large animal deaths related to traffic incidents per year. Most of those happen at night, in poor weather or involve vehicles exceeding the speed limits. The citation for speeding in a National Park is a Federal Ticket and can include Federal Charges if not handled properly. Points are not applied against your record for Federal Tickets, but they could land you in Federal Court. In 2010, Rocky Mountain National Park had a series of challenges keeping people from cutting new trails in the wilderness. Hatchet marked trees and plants torn out or crushed caused concern among park rangers. Not only was there permanent damage to the resources they strive to protect, but these new trails were luring unsuspecting hikers into unknown territory. Backcountry hikers can get lost and find themselves in terrain they were not prepared for by following non-established trails in the wilderness. 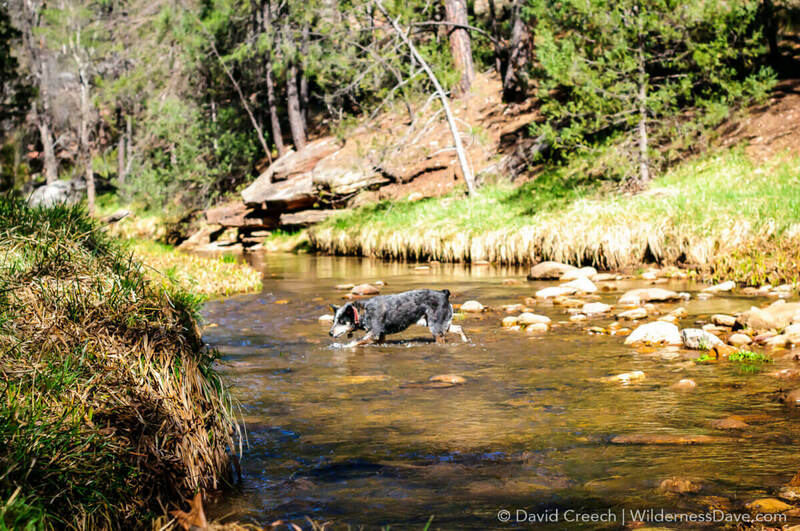 Even experienced hikers can get themselves in over their heads chasing game trails or bushwhacking. There have been several rescues just this month in Olympic National Park involving experienced hikers who got themselves in bad situations off-trail. There are countless stories of injury, rescue and death in Grand Canyon National Park due to visitors straying off the established trails. Aside from the personal risks there are long term environmental issues with allowing off-trail hiking in National Parks. The sensitive ecosystems of the Parks would not be able to sustain the over 3 million annual visitors all blazing their own trails through the wilderness. The damage would be devastating. This one came as a suggestion from the National Parks Service on twitter. The National Parks have some outstanding Visitor’s Centers. Some of the most visited National Parks like Grand Canyon, Yosemite, Yellowstone and Zion have built huge visitor’s centers and museums full of information, activities and exhibits to help you understand the park. Some even have movie theaters! As amazing as these visitor’s centers are, they are not meant to be the main attraction. The visitor’s center is a great place to start your visit, grab a map, learn about the trails, wildlife and geology. Once you’ve had your orientation, it’s time to get out and explore! The real attraction at the National Parks is nature and the best way to experience it is in person, not through videos and photographs at a visitor’s center. You must get out and witness the geysers in Yellowstone, feel the rough sandstone cliffs at Grand Canyon and gaze in awe at the massive granite cliffs in Yosemite Valley. Our Parks are a study in contrasts from the white sands of Dry Tortugas National Park to the black lava crust at Hawaii Volcanoes National Park, from the lowest point at Death Valley to the highest point on Mount McKinley in Denali. The National Parks represent some of the most amazing and unique landscapes our country has to offer. It would be a shame to limit your visit to a few maps and exhibits. In Fall of 2009, a group of hikers in Grand Canyon National Park hit the emergency button on their SPOT device 3 times in two days. They refused rescue each time claiming they just needed water and were worried about dehydration. On the third call, rescue operatives gave them no choice and extracted them from the canyon (they were given citations). In April, 2010 two young men died in Zion National Park while trying to float the Virgin River in a hand-made log raft with no experience and no supplies. The National Parks have countless stories of rescues or deaths from people hiking arduous backcountry trails with no maps, sunscreen, food or water. There is a bizarre complacency with tourists in National Parks. They seem to forget that they are in a rugged wilderness area that can be very unforgiving. Rescue operations can cost the National Parks Service hundreds of thousands of dollars per incident. The search for two lost skiers in Grand Teton National Park in 2009 cost the park $115,000 including $33,000 for the use of the rescue helicopter alone. Aside from the financial costs, every rescue operation is inherently dangerous to the rescuers. 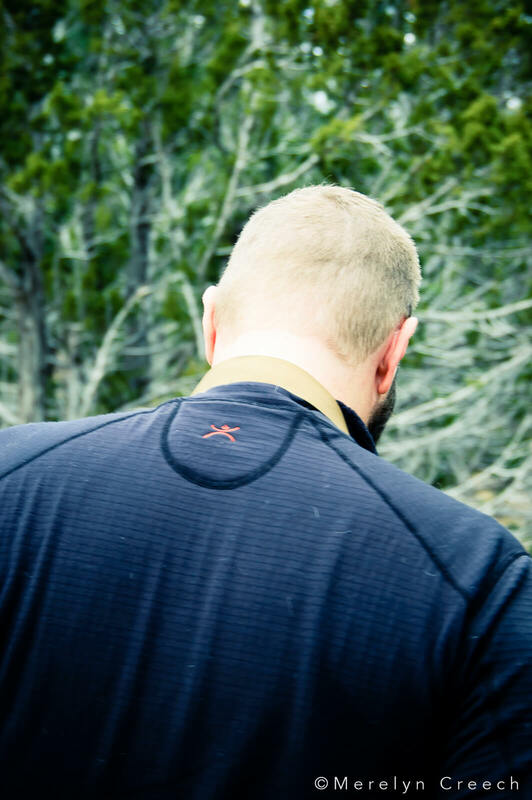 Your poor decision making or inability to be prepared before you hike puts lives in danger. Do your research, check the visitor’s center and ask the rangers about what you will need to safely hike the Park’s trails. With a little knowledge, preparation and awareness you can explore the parks safely and comfortably. Do your research. 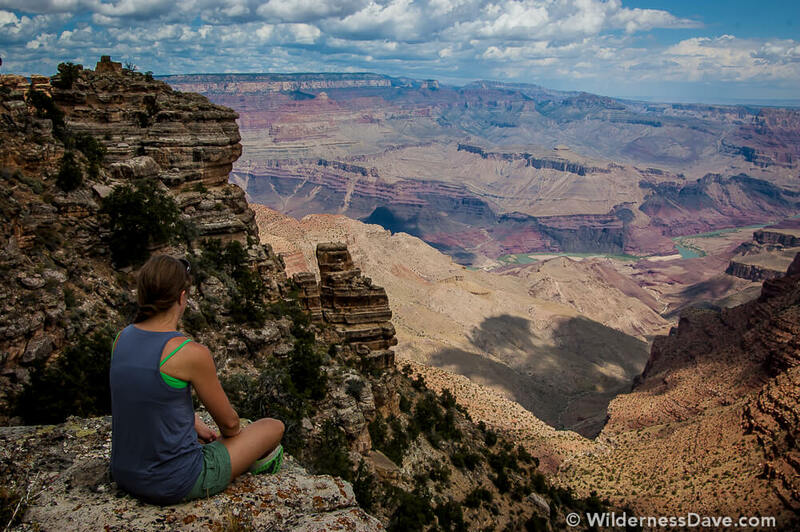 We got the inside scoop on Shoshone Point from one of the Park Rangers at Grand Canyon National Park. He had suggested it after we had mentioned we were looking for easy hikes due to my injured foot. He had said it was a flat, easy trail only about a mile out and offered great views of The Canyon. Normally pretty quiet, the trail was busy with car traffic when we got there. Turns out the trail is actually a dirt maintenance road and the evening we were there it had been reserved for a wedding. Luckily they were wrapping up just as we got there and we soon had the place to ourselves. My wife and I both love photography and usually, while I am setting up for wide-angle panoramic shots, she is catching the shots I can’t get. It’s a pretty effective system and I love to go back and look at her stuff after the fact. Shoshone Point has a unique monolithic rock structure that sits at the point. People get their picture taken next to it, some climb it. As we sat out at the point sunset started and shot intense light across the canyon lighting up the canyon walls and making for some dramatic panoramic shots. I was busy shooting the canyon but thinking the whole time about that monolith and how it must be lit up so nice with the intense sunset light. It would be a cool shot, but I didn’t want to miss the bigger stuff in the canyon. When we got home I started going through my wife’s pictures for post processing and found the shot. She had managed to capture the monolith lit up during the sunset and it is an amazing shot. This is why we make a great team! Shoshone Point was pretty amazing and I’m glad we’ve got the shots to remind us. This year was a big year for cactus flowers in the southwest. All around Phoenix the cholla and prickly pear were bright with colorful blooms because of the seasonal rains. Saguaros bloom later in the Spring than most of the smaller cacti, so as we entered May I knew I should be on the lookout for saguaro blooms. I had heard that they had already started popping up in Saguaro National Park West near Tucson, so my wife and I headed out to spend a couple of days at the park. There is no camping in Saguaro National Park, so we camped just outside the park and drove in every morning to hunt for Saguaro blooms. Apparently it was still early in the season for the Saguaros and we really had to do some serious searching to find any flowers, and the ones we did find were hard to get pictures of. Saguaros bloom at the top of the main trunk and arms, which are usually 20 to 40 feet in the air and hard to shoot from the ground. But after some serious hunting we finally found a saguaro with an arm that was twisted and bent toward the ground…AND had a bloom! It was way off the road and we easily could have missed it. We parked the truck and hiked across the desert to get to the old cactus bowing gracefully to show us it’s beauty. My wife and I shot a lot of stuff on that trip but this shot is still one of my favorites from that Park. How are you Inspired to Travel? I have always traveled a little, 3 or 4 day trips on the river or whatever. My first major trip was back in 1998, I was 22 years old and it shaped the way I look at travel. I had been studying the pre-Columbian cultures of Central and South America for a couple of years and I was obsessed not only with the architecture of those cultures but the stories of the explorers like Hiram Bingham who discovered those lost cities. I made up my mind that I wanted to see some of these places for myself and began researching the trip. A year later I found myself in Peru for over a month walking among some of the sites I had seen only in books. I was inspired by the stories, the history and the amazing pictures (I specifically blame National Geographic for this) of these remote places. That trip made such an impact on me that I fell in love with travel and make it a priority in my life. When you make the commitment to travel you are taking time away from your job, your responsibilities and potentially committing a decent amount of money to the cause. It’s not generally something people take lightly, even for a simple weekend trip not far from home. Travel for some is a necessity, a break from the stress and confinement of everyday life. For others travel is a lifestyle and their job is a means to an end. Either way, we usually have reasons for the places we seek in our travels. Some piece of inspiration that has drawn us in that direction. I know for me it has a lot to do with images, with photographs shared by other travelers of amazing sights of exotic and unique locations. I am inspired by the thought of seeing new things and experiencing different cultures. When you consider planning a trip, what inspires you to visit a specific place? I always return from trips and share my stories with friends and family. There was a time when I would come back and specifically plan dinners or visits to share stories from my trips. I have always brought back photos from my travels as well and back when I shot film I used to pass around the stack of prints to interested friends. I know I’ve inspired more than a few people to travel to places they never considered. What do you do to inspire others to visit the places you love? Images and stories, they do sell an experience. A picture is worth a thousand words but can it really convey the personal experience of your travels, your adventures? I think the two work together, hand in hand a picture backed up by a personal story seals the deal. When it comes to inspiration, which is more powerful: Stories or pictures? How well do you know your gear? When you get a new piece of gear or equipment, do you take the time to really get to know how it works? How to take it apart? How to put it back together? Honestly, most of the time it’s really not that complicated and the implications of having to learn in the field are not that severe. Sometimes, though, your life can depend on knowing the inner-workings of your gear and gaining some experience on how to recognize and deal with problems. When I decided to buy the KLR for back road adventures I knew I’d likely be taking myself places where other travelers are few and far between and mechanical problems could put me in a long term recovery situation. I hadn’t owned a motorcycle of any kind in years and even when I had, I didn’t really work on them that much so I needed an education. I asked around about and read some articles to figure out what the most common problems I would face in the field would look like and started trying to address those. 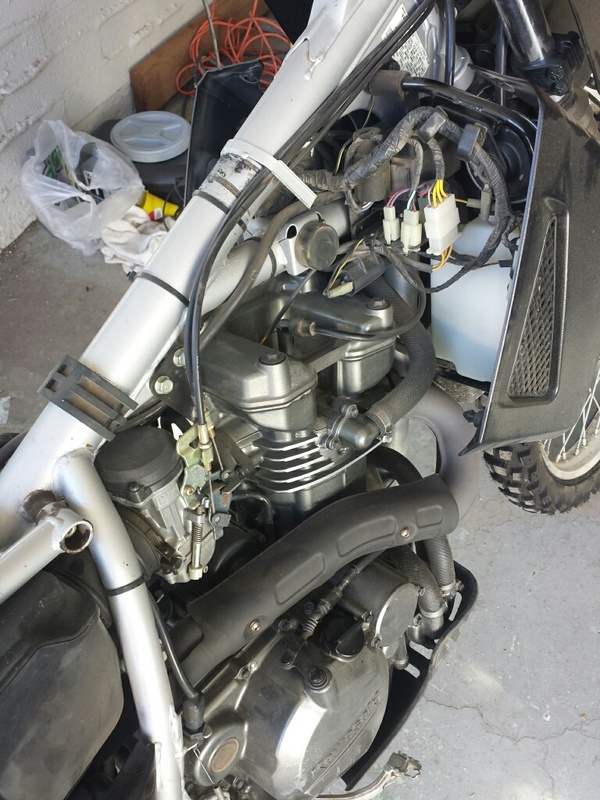 When the motorcycle ended up having some real issues I was forced to dig in and really learn how to troubleshoot, break down, and repair the problem. Luckily this happened close to home and I was stranded in the backcountry. For some reason I was really worried about rebuilding the carburetor on the bike. I think I had decided, well before I ever started researching or tooling around, that it was complicated and beyond my skill level. Even after watching a few YouTube videos (great source material there) and reading the manual I was still a bit apprehensive. 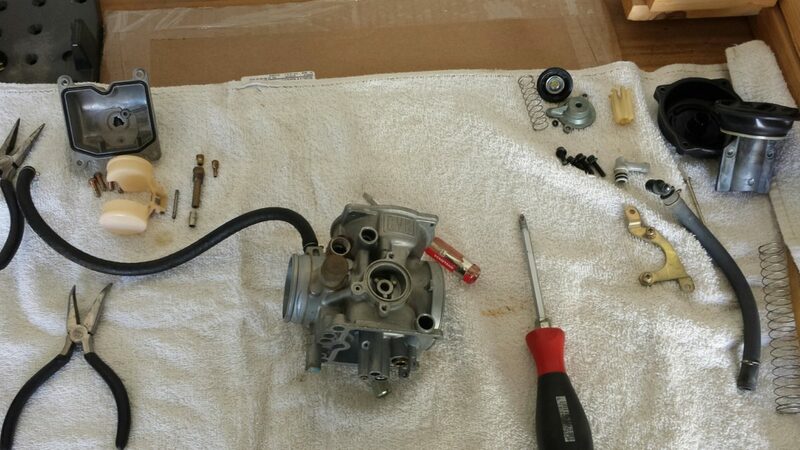 I took it step by step, followed one of the better videos I found to remove and disassemble the carb, then reassembled it and put it back on the bike. 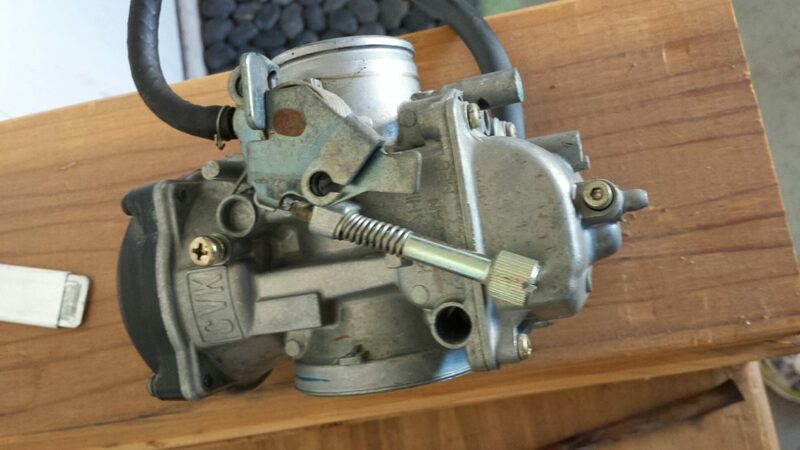 I’ve since removed and reassembled the carb several times and can now complete the whole process pretty quickly. Chasing an issue with the carburetor also allowed me to check the entire fuel system and learn how the entire system functions so I can better troublshoot problems as they come up. I also spent some time, while the bike was disassembled, learning how the electrical system works on this particular bike. It’s dead simple stuff, but just knowing where the wires run, where the grounds are, where potential failure points exist are all valuable pieces of information when it comes to chasing down an issue. The process of elimination in troubleshooting is much easier when you have a clear understanding of what the picture is supposed to look like and where the potential for problems exists. Aside from troubleshooting and working on problems I’ve also worked my way through a lot of the basic maintenance: oil change, filter changes and cleaning, new spark plug, carb cleaning, cleaning and charging the battery, checking and cleaning the brakes, adjusting suspension, installed new tail lights, etc. All pretty basic stuff any wrench could do in his sleep, but I had ZERO experience with prior to owning this bike. The only thing I haven’t done on my own yet is a tire change/repair, which is pretty critical on longer rides. Sometime soon I need to run through the process (before I am forced to) so I at least know how to do it. Luckily, the older model KLR that I have is about as simple of a machine as they get. The learning curve has been very forgiving. But the more knowledge I can acquire about how to deal with problems, the more confidence I will have to take the bike places few people go. And that’s kind of the point. Later this year I plan on doing a nice long road trip on the KLR in some remote country where help is not readily available. I don’t plan to be alone, but I will need to be prepared. Self-sufficient travel is the key to adventure. What equipment do YOU rely on when you travel? Are you capable of fixing it yourself on-the-fly? I was pretty depressed about having to give up on the Zion Half Marathon this year. I was really looking forward to training for it and running in such a cool place. My knees and feet just weren’t going to cooperate. Still, my wife and I both needed some time to recharge and we wanted to take the dogs camping in cooler weather. 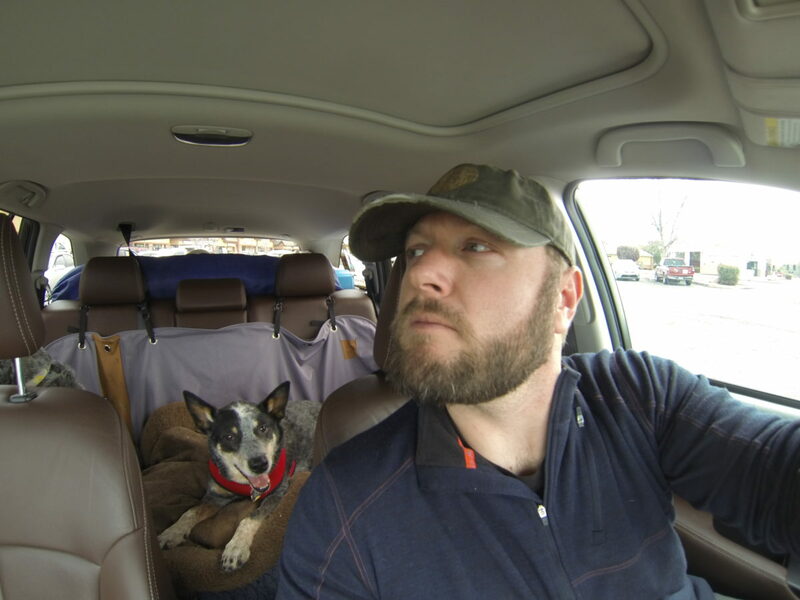 Our new Cattledog, Max, had yet to go camping with us and we really wanted to see how he would do. We’ve had him out on the trails and in forest areas and he really loves the freedom to roam and sniff and track and run and do dog stuff. We just weren’t sure how he would handle the colder nights and sleeping in the tent with us. We hoped he would pick up a few lessons from Wiley, who loves camping and sleeps very well in a tent. We decided we had a couple nights to kill, so I set out to look for a suitable campsite location that would work for us and the dogs. 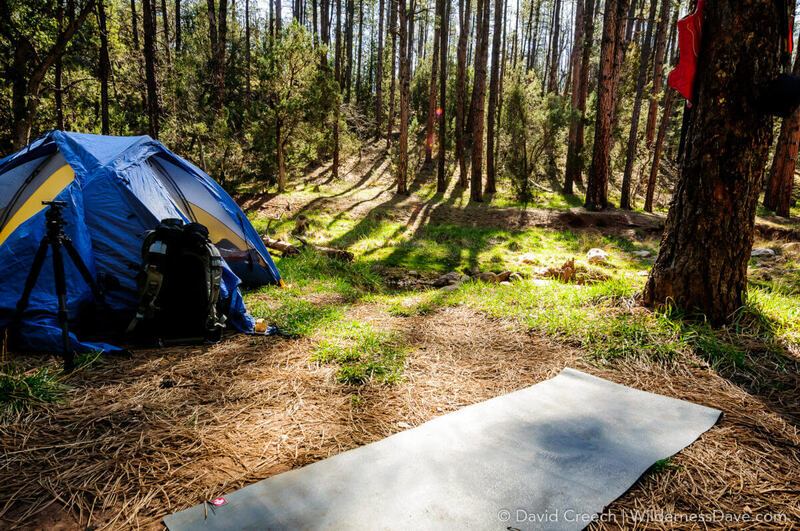 March is a great time to camp in Arizona, but a poor time to find designated camping up north. Most of the camp areas are still closed for the season (I have no idea why) and the few that are open either don’t allow dogs, have very strict rules for dogs or are located right off a highway (not very relaxing or scenic). So I made some phone calls and did some research on locations. Prescott didn’t pan out, Sedona was problematic and everything near Payson was closed except for remote dispersed camping. Remote and dispersed sounded just fine to me so I started pouring over an old Tonto National Forest map for camp sites. It was a really old map. Things were not as they seemed. But we had a direction and that was enough, we packed up and headed toward Payson. After a few stops at the store for “forgotten” items, we finally headed down the old 199 road out of Payson toward the base of the Mogollon Rim. According to my very old and less-than-accurate map there were a handful of open, dispersed camp sites along 199 near the East Verde that would work. There were not. What used to be dispersed camp sites were now paved, regulated, day-use-only picnic areas. Another day-use-only site. Keep going. The next one was day-use-only AND marked private property with no trespassing signs. Still, we had decided on a direction and we would keep driving until we found something. We finally got back far enough the road turned to dirt and things started to look more promising. Dirt roads are a sure sign that things will improve. The dirt road crossed, then roughly followed, a small creek. As we drove we could see small camps along the creek. No signs saying day-use only, no private property, no indication that we were not allowed to be there. And then we found it…the ideal camp site. Small adventures or big, it just doesn’t get any better for me than camping next to moving water. Maybe it’s from all the years I spent camping on whitewater trips, sleeping near the river and having water near camp. 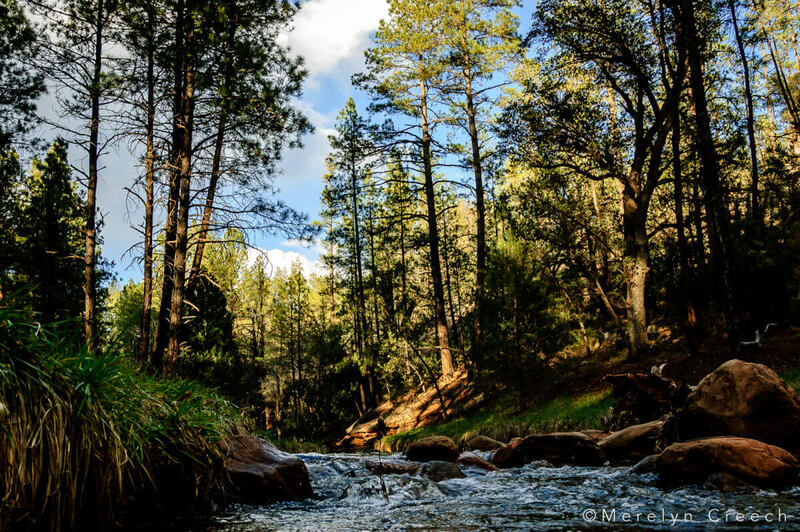 It just makes everything about being outdoors and camping better to be near running water. 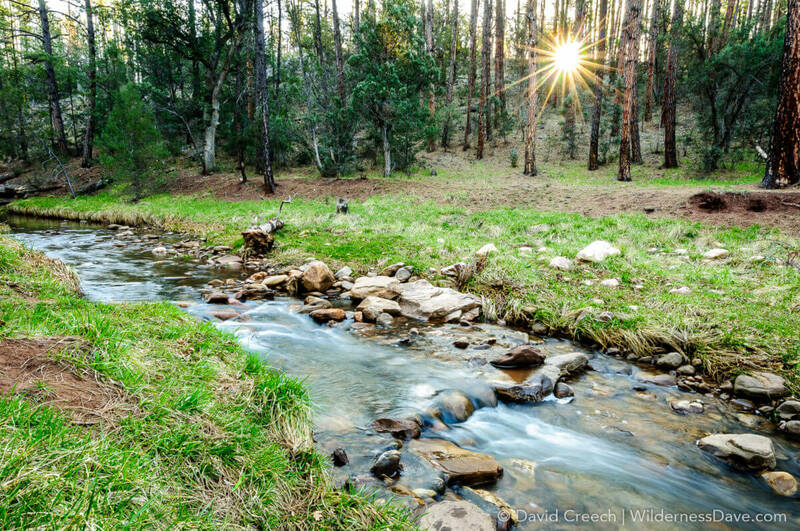 The creek we camped next to was perfect. It was nice cool water, babbling quietly along, weaving around small rocks. The simple combination of tall trees, cool grass and moving water was enough to set me at ease immediately. The dogs didn’t stay on the leash for long. We had the place entirely to ourselves and we soon let the dogs loose to explore on their own a bit. Max ran and jumped and played releasing his overabundance of energy as soon as we let him off the lease. It was even enough to get our normally grumpy Wiley to play and bounce like a puppy. 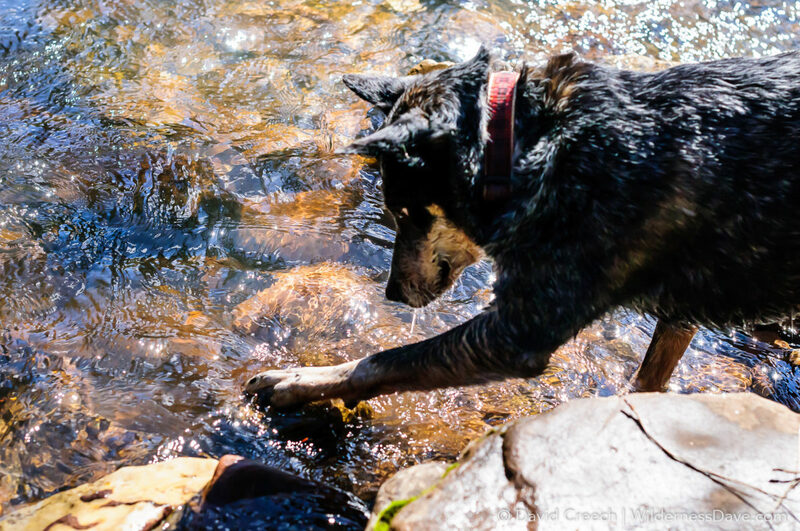 Then the two went to go check out the creek, something that became a source of constant fascination and play. We settled in and stayed at camp for a couple of days, relaxing, reading, napping and simply enjoying the quiet. It made me realize that I don’t get this kind of unplugged solitude often enough, I don’t take enough opportunities to get away and recharge. My health has kept me from doing some of the larger adventures I long for, but I have often overlooked or passed over opportunities for smaller adventures. It only takes a night or two in a new place, an afternoon outside of cell service or a long morning ride on the motorcycle with nothing but the wind and the road asking for your attention. Small adventures make a big difference in the long run. When we skip over these minor opportunities because our hearts are set on grander goals we often miss out on a lot. This was minor in the world of adventure travel. It may not have been weeks away from home traveling to exotic locations, but it was precious, peaceful time in a beautiful place with great company. I’ll take that any day I can get it. Oh, and Max…he did great. He loves camping and loves the tent. In fact, he loved it so much that on the second night he decided he didn’t want to wait for us and asked to get in to the tent early. I think it’s safe to say he did well. Keeping warm on the go is about layering. Hiking, climbing, snowshoeing, skiing it doesn’t matter, you body temp is going to fluctuate throughout the day as conditions and exertion changes. Throughout even the shortest window I have worked through being completely bundled up down to a t-shirt and back again because of things like my pace, elevation, sun exposure, shade, wind, wet conditions, etc. So for baselayers to make the grade in my book they have to be dead simple, fit well as a layering system, pack away easily and hold up to some abuse. The Terramar Climasense layers I got to try out this season as part of the Terramar Tribe fit all the criteria for no-nonsense baselayers. 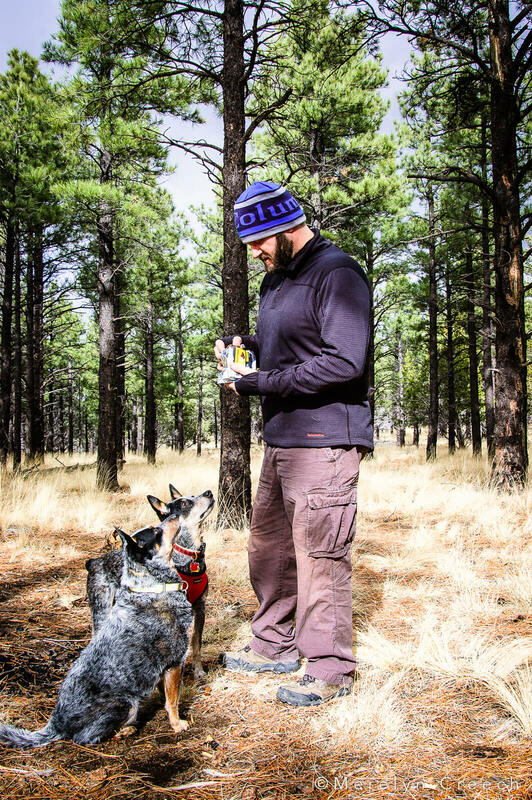 It hasn’t been terribly cold here in Arizona yet this season but we’ve had a few days here and there where it was a little nippy, the light Thermolator 2.0 layer works well under my everyday wear to fend off nighttime lows. 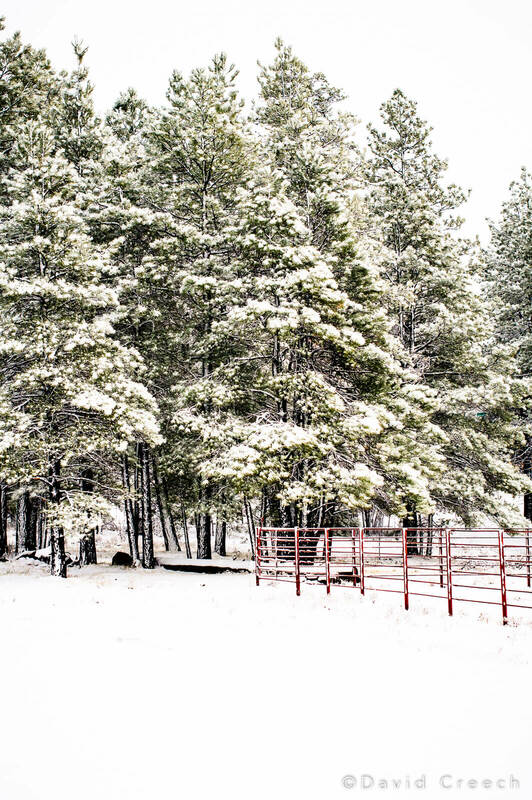 When we headed up north recently to let the dogs run around the forest outside Flagstaff we just happened to be up there for the first snow of the year and I got to see how well the multiple layers functioned together. One think I really like, and don’t see enough of, us thumbholes in baselayers. I hate having the sleeves crawl up my arm as I layer up forcing me to dig up my sleeve to find the lower layer. The Terramar Climasense line has thumbholes on each layer so they don’t bunch up on you as they come on and off throughout the day. The material for the against-the-skin layer is nice and soft unlike some of the other baselayers I’ve tried. After a full day of wear and movement it was still as comfortable as when I put it on. In general I really found the Terramar Thermolator and Ecolator fleece to work really well for me in the field and comfortable enough for everyday wear. I have actually been wearing the Ecolator Fleece around town quite a bit. Terramar Sports provided these products to me as part of their Terrmar Tribe ambassador program in exchange for my fair and honest review and product feedback. My opinions are my own and are not influenced by the brand.